Because I now have two email accounts, GMAIL and YAHOO, we can compare the efficiency. This message was received by my Yahoo account at 3:01 pm EST in a timely fashion to make the trade. You might want to consider opening a Yahoo Mail account and recommend it to your subscribers, or at least pick one or two of them to add the Yahoo acct and then compare to see if they got the same results that I did. Notify them and then send them the two emails and ask what time they received them. So there you have it – the solution to this problem has been set out. 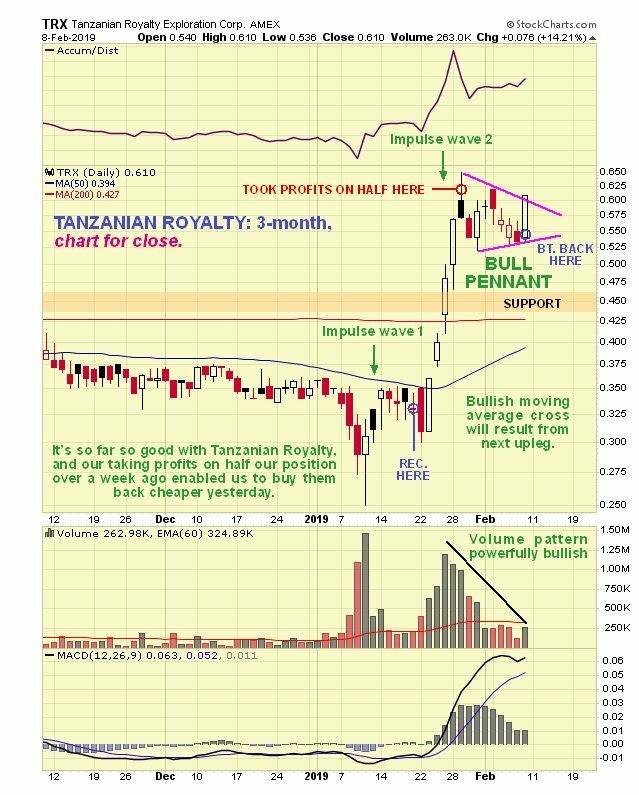 Finally it is important to note that although yesterday’s action was certainly bullish, it does not necessarily mean that Tanzanian Royalty is starting its next run now – the Flag may not yet be complete and it may zigzag around within it for a while longer yet before the next upleg starts, in which case we might need to adjust its upper boundary slightly. That said there is a fair chance that yesterday's move does indeed mark the start of the next upleg. 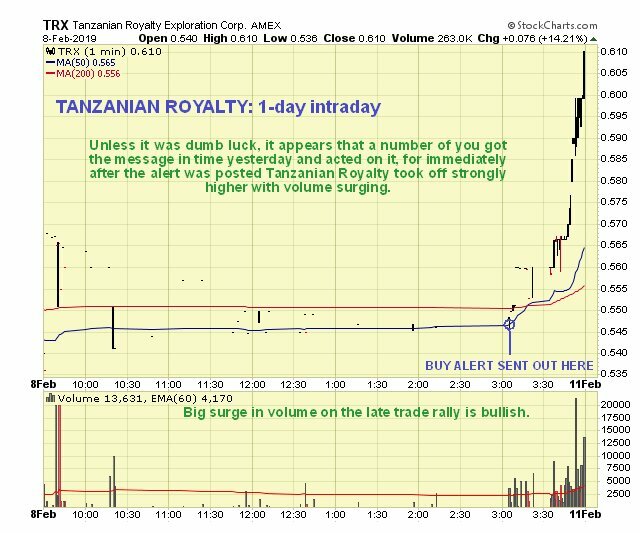 Tanzanian Royalty Exploration Corporation, TRX, TNX.TSX, closed at $0.61, C$0.80 on 8th February 19. 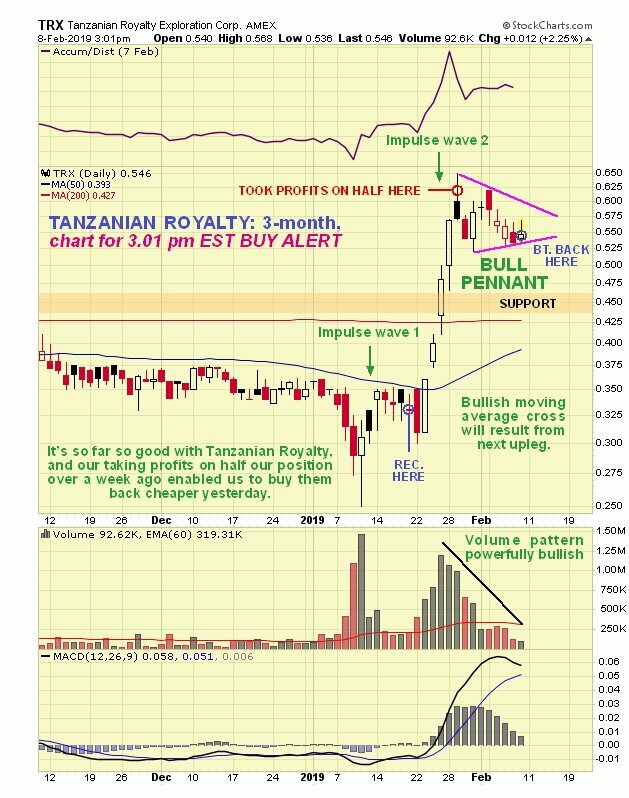 Posted at 3.05 pm EST on 8th February 19, version updated with charts and additional commentary posted at 1.45 pm EST on 9th February 19.